16 Canvasback is a beautiful 3 bedroom, 3 bath beach home that is updated on a regular basis. Featuring a state of the art private pool, outdoor spa, screened-in porch, gourmet kitchen and wonderful location, this vacation home is seconds from the beach path and only 4 rows from the Atlantic Ocean beach. Special features include hardwood floors in the living room, dining room and bedrooms and brick floors in the kitchen and combination Screened-in Porch/Carolina Room. Bedrooms have tray ceilings, mounted flat screen TV's and ceiling fans, and skylights are in the living room and baths. The kitchen has granite counters and stainless appliances including both conventional and convection ovens. A double set of French doors graces the opening of the living room to the Screened-in Porch/Carolina Room which opens to the pool. The kitchen and baths are renovated with granite counters and updated fixtures, and the Dining Room has beautiful tray ceilings. Guests of 16 Canvasback enjoy the combination Screened-in Porch / Carolina Room which is a perfect retreat from the sun, great for dining and opens to the pool deck. Pool deck is fully equipped with gas grill and patio furniture, and you will absolutely love taking a dip in the private 31 x 19 swimming pool and outdoor spa. *Please Note: the pool has been converted to saltwater (chlorine-free) and the pool, spa and pool deck have been completely resurfaced for Spring 2019 rentals! The one level floor plan has great flow and charming touches including floor to ceiling windows, French doors and large rooms. This home enjoys a wonderful sense of privacy although the Sea Pines beach is just steps away. Read The Story Behind 16 Canvasback as shared by the owner of the home. Very attentive! Appreciated the welcome phone call and meeting our needs! Though we could not get the house we had originally rented because of storm damage, we were given a very nice replacement. The house was comfortable and clean, and it was very close to the original one so we didn't lose proximity to the ocean. We really appreciate that you found us another so similar and now we have another choice to rent when we come in the future. I always get exceptional help when I call the office, and I refer people to Destination Vacation when I can. The beach was just a short walk from the house, the hot tub was wonderful especially since the weather was not beach-friendly. We had a wonderful time and hope to be back again soon. Guest: Ted and Camille B. We stayed at 16 Canvasback. This was our second time staying at the address. We like the fact that you can get in and out of the back gate quickly. Love the screened in and glass enclosed porch room. I would suggest having locks on the master bedroom door that connects to the second bathroom thst can be locked from the master bedroom for more privacy. We had grand kids in the next room and they wanted to come in our bedroom through that bathroom. A need for more privacy could be met by changing the lock configuration. Loved getting a housewarming gift from the owners. Please give them our thanks. We stayed the week of March 18, 2017. Manager's Note: The owners of 16 Canvasback appreciate your feedback and quickly approved a locksmith to add an additional lock on the master bedroom door so it now locks on both sides. They also did the same thing for the hallway bath to ensure maximum comfort for every guest. Thank you for the suggestion! We really enjoyed 16 canvasback. It's a really nice home that met our needs well. Destination Vacation was great-better than most vacation rental companies. The house, furnishings are pool were great. The house was very clean and well equipped upon arrival. The location which had an easy walk to the beach and a private pool with lots of deck space and great afternoon sun was excellent. The Carolina room was a welcoming space to relax in the shade. We did have a couple of maintenance issues but the Destination Vacations team were very responsive in getting them taken of quickly. I would highly recommend working with Destination Vacations. They do a tremendous job communicating during the entire process. We enjoy Sea Pines. For sure we enjoyed this home. We had two families and there was lots of room for everyone. 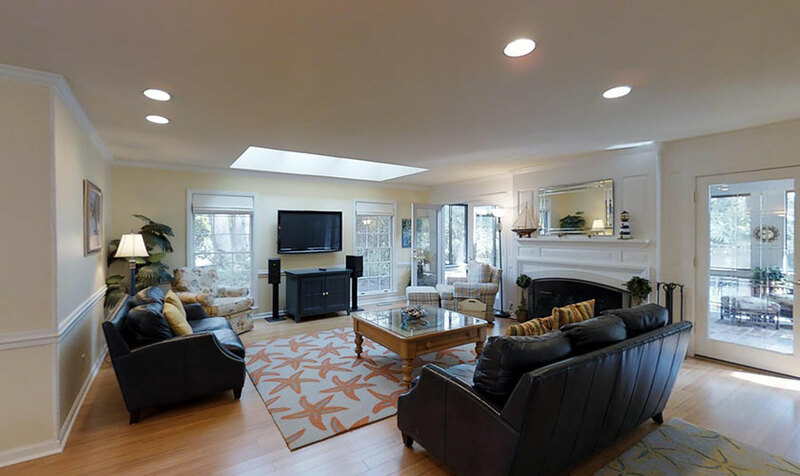 The owners have renovated the home in many ways and it sure deserves to be listed as 5 stars. Thank you! Destination Vacation is a great company and they responded to our needs quickly and efficiently! Once again, we would return! Close to the Beach close to the entrance and close to all amenities. Excellent accomodations, very good service. Very nice place to visit.